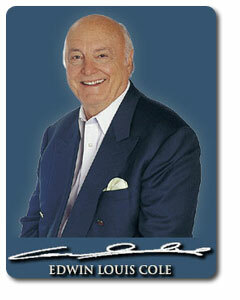 The first time I heard Edwin Louis Cole speak was in December 2001 at the Christian Cultural Center in Brooklyn, New York. It was a men's ministry seminar where approximately 2,000 men had come to hear him speak. His message was clear and direct, aimed at helping each man understand that they were to reflect Christ within themselves to others, as God reflected Himself in Jesus Christ. The anniversary of his departure from life here on earth, into Heaven was four years ago this past Sunday. I was blessed to have been able to see him preach in person that day, the single message that God called him to tell the world, that Manhood and Christlikeness are synonymous. There are a number of families that have been changed because of the change in these men as husbands, fathers and single men, how to be Maximized in their Manhood for God. 1, 2, 3 YES!!!! “And then he died” is the most oft-repeated phrase in the book of Genesis. Ed Cole, a spiritual father to both you and me, taught us that the first five books of the Bible are the stories of seven men. What was Moses telling us as he wrote and recorded the lives of the great fathers of the faith? Dad died on August 27, 2002, at 3:15 pm in Grapevine, Texas, surrounded by his family who counted his final breaths with tears, singing and joy. In the months following, each member of the family and our worldwide circle of adopted brothers and sisters dealt with the absence of his presence in our own ways. My sister Lois was deeply affected and remained so for many months. She would dream most nights of a living, loving mother and father, then awaken each morning to the reality that it was a dream, and they were gone. One day as she was driving, the song “I Can Only Imagine” came on the radio. In December 2000, when Mom left, Mercy Me had just come out with this song, and we used it as the theme of Mom’s video tribute. “And then he died” is earth’s prelude to the most wonderful appointment of every life. Words sprang to my mind — “Precious in the sight of the Lord is the death of His saints” [Psalm 116:15]. Scripture after scripture reeled off where the Lord repeated that our days are numbered. Any question that may have lingered about Dad’s sudden departure dissolved. God had longed for that appointment day with Dad since He placed Dad on the planet and told him to “Go, be fruitful and multiply.” Dad had simply filled his space on this earth so fully — expanding his life through God’s magnificent work of grace which launched the men’s movement and changed the world — that it almost seemed wrong for him to leave. Today there is scarcely a global Christian leader that my family talks with who wasn’t affected by the Lord’s ministry through Dad. What a challenge! One day, God will record in His book for each of us, “And then he died.” It is our honor to exercise our power of choice2 with our helper, the Holy Spirit, and write the pages of a life that leads to that final sentence. 1 Find it in Absolute Answers. 2 The best of Dad on the power of choice is in Real Man.